A figure skater must look nice and neat at all times. It's important that skaters don't come to the rink looking messy or sloppy. Ice Fire Skate Wear makes it possible for female ice skaters of all ages and sizes to look good every time they come to the rink. How Ice Fire Skate Wear Came About: Ice Fire Skate Wear was created and developed by Tatiana Zaytseva, a figure skating coach based in Los Angeles. Zaytseva toured the world as a professional show skater in both Holiday on Ice and on cruise ships. As a figure skater growing up in Moscow, Zaytseva remembers that skaters in the Soviet Union had very plain practice skating clothes. They usually wore the same outfit every day; they only were allowed to wear pretty and sparkling skating clothes at competition time. Tatiana met her husband to be when she did some professional skating performances in the USA. The couple settled in the Los Angeles area and had a little girl. When her daughter became a figure skater, she decided that today's ice skaters need beautiful clothes for figure skating practice. She didn't want her daughter and others to practice and skate in boring clothes. In recent years, most figure skaters practice in figure skating pants (in addition to skating dresses). Figure skating practice clothes offered by Ice Fire Skate Wear include ice skating pants, ice skating jackets, Swarovski jewelry, boot covers, skating clothes for dolls, and rhinestones. Many of Ice Fire's designs include rhinestone covered appliques. These designs can be custom designed or a skater can choose a standard design from Ice Fire Skate Wear's website. Tatiana Zaytseva says that the quality of the practice clothes she skated in Moscow was not only plain, but low in quality. For that reason, she uses high quality materials in her Ice Fire Skate Wear skating designs. The skating jackets and skating pants are made out of Polartec materials that keep skaters warm. She also uses high quality rhinestones and appliques in her skating clothes. 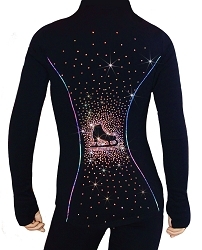 Ice Fire Skate Wear uses Swarovski rhinestones and similar high quality rhinestones. Ice Fire Skate Wear does not use cheap or imitation rhinestones. In addition to skating clothes, the Ice Fire Skate Wear company sells fun colors skating boot covers, gloves and tights. A beautiful gift item is a skating jewelry set which includes a figure skating necklace, bracelet and key chain .Accessories:Many little girls enjoy dressing their dolls in skating clothes. Ice Fire Skate Wear has created beautiful clothes with appliques and rhinestones especially for 18 inch dolls. Figure skaters can purchase a matching outfit for their dolls. Just like the Ice Fire Skate Wear's designs for girls, the clothes for dolls are made of high quality materials. Dolls can be dressed in clothes that may include high quality Swarovski rhinestones. In 2012, Ice Fire Skate Wear introduced a Criss Cross Collection which includes Polartec pants and a jacket that can be ordered as a matching set. A pretty and colorful "ribbon type" design is the highlight of the Criss Cross skating pants and jackets. Ice Fire Skate Wear can be purchased at several ice skating rinks in the Los Angeles area: Pickwick Ice, Van Nuys Iceland, and at L.A. Kings Valley Ice Center. In addition, her items are available at LIC Pro Shop in Lexington, Kentucky.